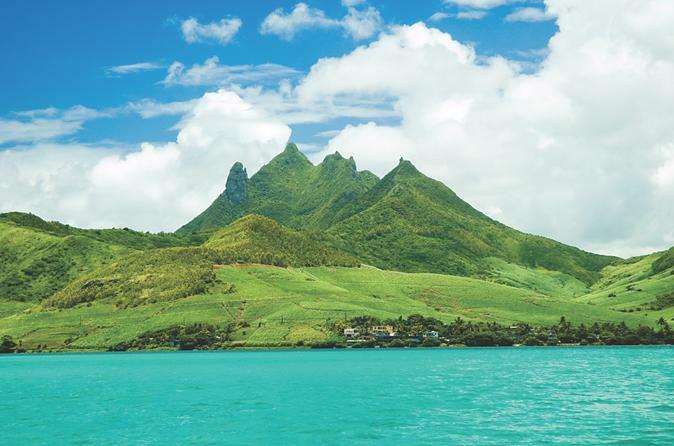 Discover a corner of paradise on a romantic cruise on Ile aux Cerf island that is surrounded with white sand beaches in a blue crystal lagoon on this boat trip. You'll also see the Grand River South East Waterfall with a south east view point showing beautiful mountain ranges. Enjoy a full day at Grand River South East Waterfall and Ile aux Cerfs which is off the east coast of Mauritius. You will discover one of our most renowned waterfall at Grand River South East. Ile aux Cerfs offers you a wealth of preciously preserved nature and an imposing and magnificent landscape and its reputed long sandy beaches and turquoise lagoon. 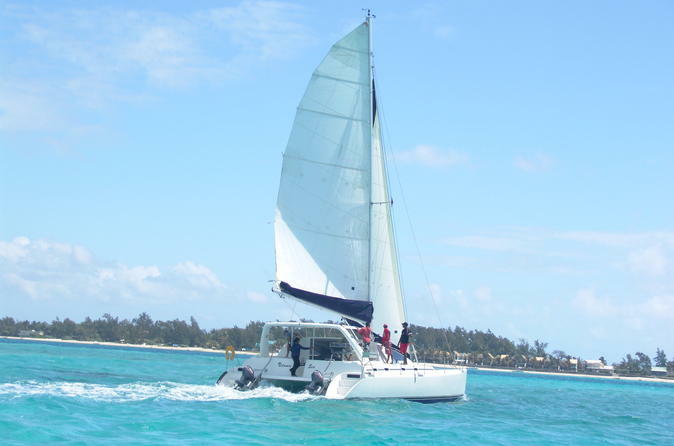 Enjoy a full day catamaran cruise across the magnificent turquoise lagoon of the east coast of Mauritius and the breathtaking views of the eastern mountain chains. You shall sail to Ile aux Cerfs which offers you a wealth of preciously preserved nature and an imposing and magnificent landscape and its reputed long sandy beaches and turquoise lagoon. Experience the real feeling and connection with nature at its best at Grand River South East Waterfall. Delicious BBQ lunch and drinks shall be served during your cruise. 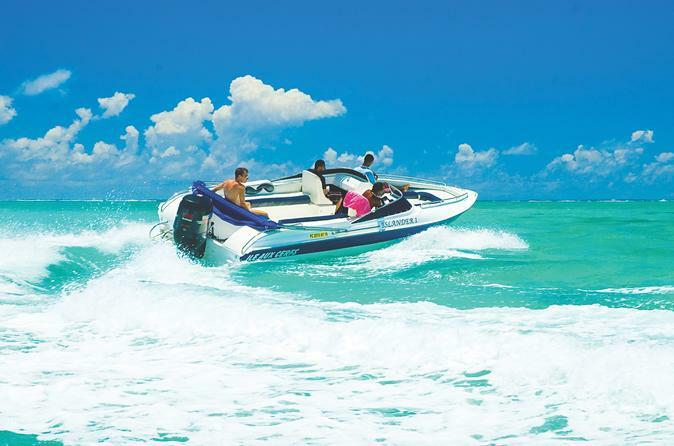 Enjoy a full day cruise in the east of Mauritius. Departing from the jetty of Trou d'Eau Douce. Your journey begins when you embark on the jety at Trou d'eau Douce. Sail across the South East Lagoon and be captured by the spectacular view of the Grand River South East Waterfalls.You can take the time for swimming and snorkelling assisting by the crew to discover the beauty of marine life of the lagoon. A Barbecue lunch with unlimited drinks are served on board by the crew. 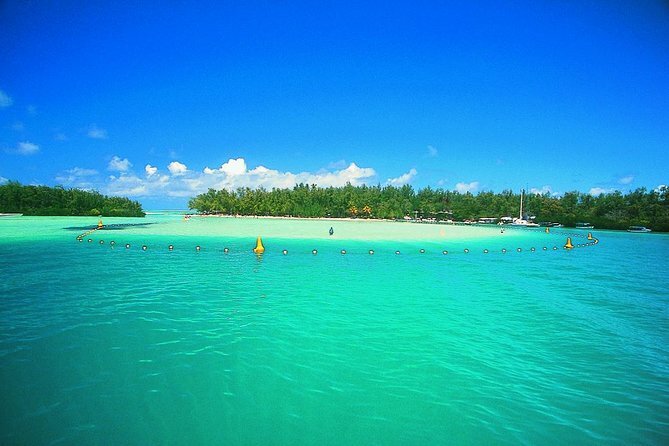 After lunch reach Ile aux Cerfs for a relaxing leisure time and be enchanted by its white sandy beaches, turquoise lagoons and all it's water and land activities. Start your excursion at Pointe Maurice, Trou D'Eau Douce as from 9am. When you arrive at the jetty, a shuttle boat will transfer you to the famous island called "Ile aux Cerfs". 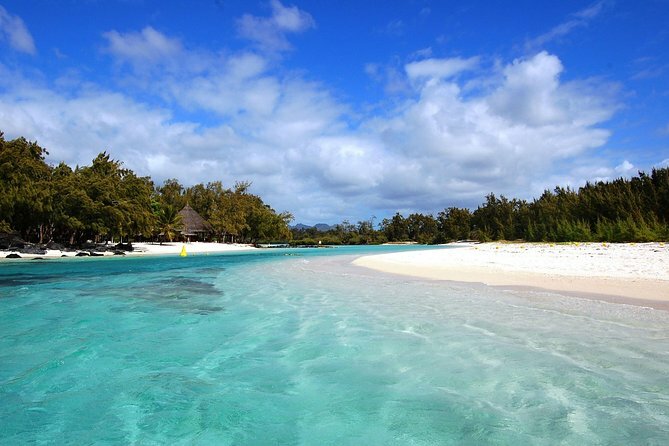 Once you arrive at the jetty of Ile aux Cerfs, a Welcome cocktail will be offered to you at the Paul & Virginie Restaurant and where you will also be able to layout your beach towel on the sand or on a sunbed at your favourite spot. Lunch will be served at the Paul & Virginie restaurant at around midday and you will have the opportunity to taste some Mauritian food. The last boat will leave the jetty at around 3:30pm. 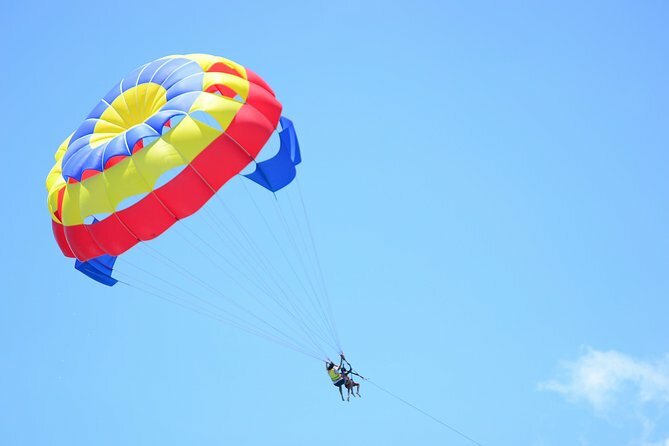 Experience the parasailing in the lagoons of Mauritius. The take-off causing a pure rush of adrenaline, will make you discover a beautiful scenery of the bluish masses of the lagoons of the east and the magnificent beaches. A landscape that will leave you awestruck. 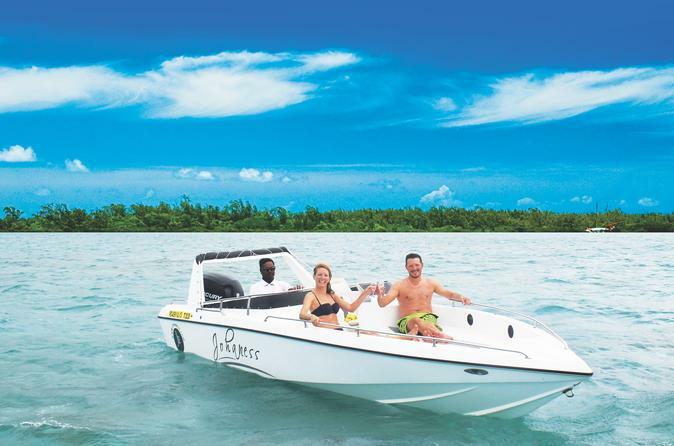 After the parasailing, enjoy a trip in our speed boat to visit the breathtaking ile aux cerfs and grse waterfalls.Then enjoy a nice bbq lunch on the beach of ile aux cerfs. Enjoy a full day at Ile aux Cerfs which is off the east coast of Mauritius. Ile aux Cerfs offers you a wealth of preciously preserved nature and an imposing and magnificent landscape and its reputed long sandy beaches and turquoise lagoon. 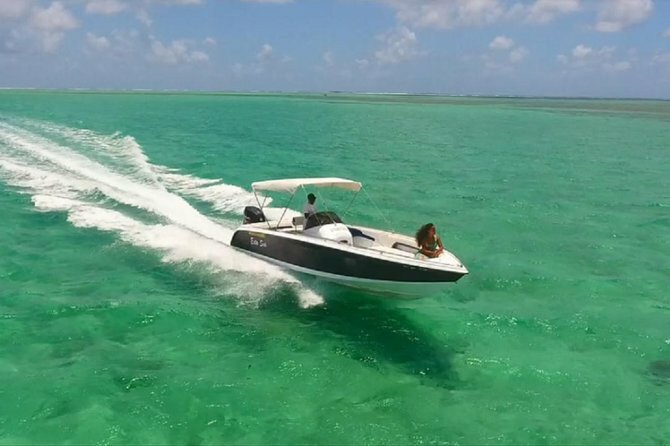 Board a the Extasea powerful speedboat at Trou D'eau Douce and visit the protected marine park of the island. Sailing in the part of the isalnd where an historical naval battle once took place between the British and the French. Barbecue lunch prepared and served by the crew on the white sandy beach Ile Aux Cerfs one of the most appreciated place of interest of Mauritius. • Sail around the massive lagoon, visit the Grand River South East Waterfalls and surrounding islands. • Get the possibility to explore the Blue Bay marine park. 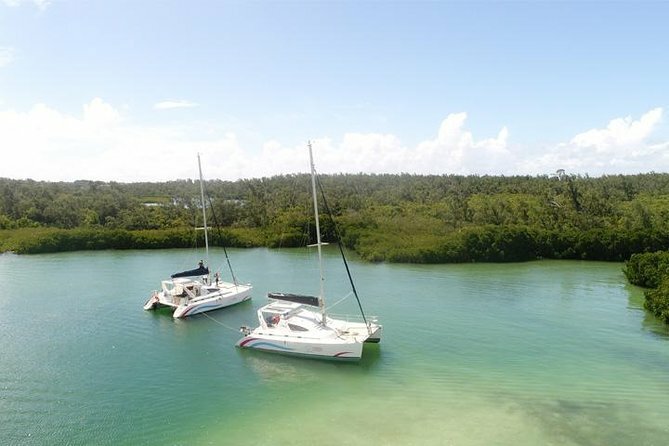 • Drop anchor at Ile aux Cerfs to relax and enjoy the views.